LONDON – The United States Women’s and Men’s Senior National Basketball teams have proven that the round ball is truly American’s game. In spited of the fact international men’s teams had over 20 players presently playing in the NBA, as opposed to the 1992 Dream Team having only 6 NBA players were on their international teams. The USA Basketball foundation and organization is now firmly planted on solid ground and during the 2012 Olympic Games it once again proved that the best basketball in the world is played every year right here in the NBA. The linchpin behind the USA Men’s resurgence has been the inclusion of Jerry Colangelo as the Managing Director of USA Basketball Senior National team in 2005. He promptly hired Duke coach Mike Krzyzewski. USA Women win 5th consecutive gold medal at the Olympic Games. Gary Montgomery photoColangelo has confidently rebuilt the program from the bottom up. Obtaining the involvement of the NBA’s top players (Kobe Bryant, Carmelo Anthony and LeBron James) and naming Duke University’s Hall of Fame mentor Mike Krzyzewski as the USA National Team head coach. In the 2004 Olympics the USA Men earned a bronze medal and in the 2006 FIBA World Championships the US Men earned another bronze. Through the solidifying efforts of Colangelo and Krzyzewski along with the commitments of Anthony and James, and, the wooing of Bryant in 2007, the foundation of USA Men’s Basketball is entrenched. In the 2012 Olympic Games Final, a rematch with Spain, young upstart Kevin Durant scored 30 points in a contest that featured 16 lead changes and six tied scores no matter, the U.S held off Spain for a 107-100 win to capture the Olympic gold medal. While Anthony and James earned a second gold medal in a third Olympic appearance; three more were members of the gold-medal winning team in 2008, Bryant, Chris Paul and Deron Williams. Playing in their first Olympics were Tyson Chandler, Anthony Davis, Durant, James Harden, Kevin Love, Russell Westbrook and Andre Iguodala. Meanwhile, for the USA Women it was business as usual. Since the inclusion of the women in Olympic Basketball in 1976, where the Soviet Union won the first two Games, the US Women captured its unprecedented fifth-straight Olympic gold (dating back to 1996), a feat never before accomplished in any women’s traditional team sport, the USA women have compiled a 41-game Olympic winning streak that began with the 1992 bronze medal game. This time around the U.S. Olympic Women’s Basketball Team posted a 86-50 win over France at North Greenwich Arena in London, England. The gold medal is a third for Sue Bird, Diana Taurasi and Tamika Catchings. 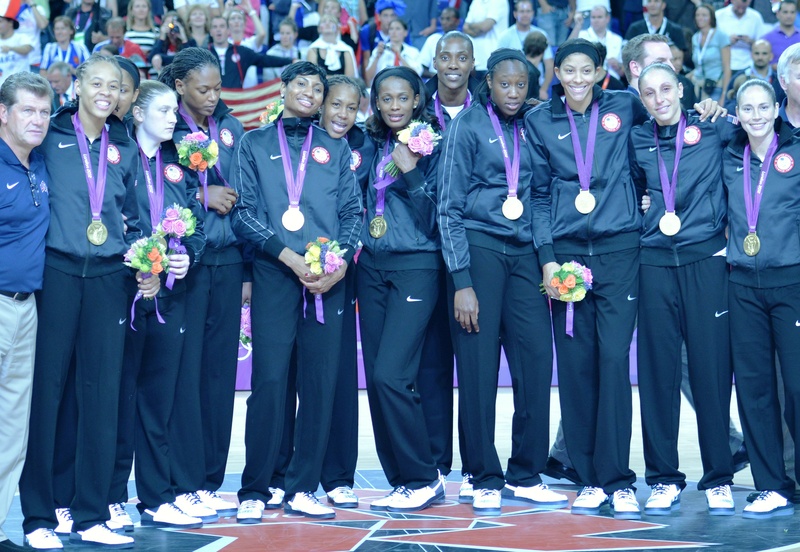 While Seimone Augustus, Sylvia Fowles, Swin Cash, and Parker also earned their second gold. 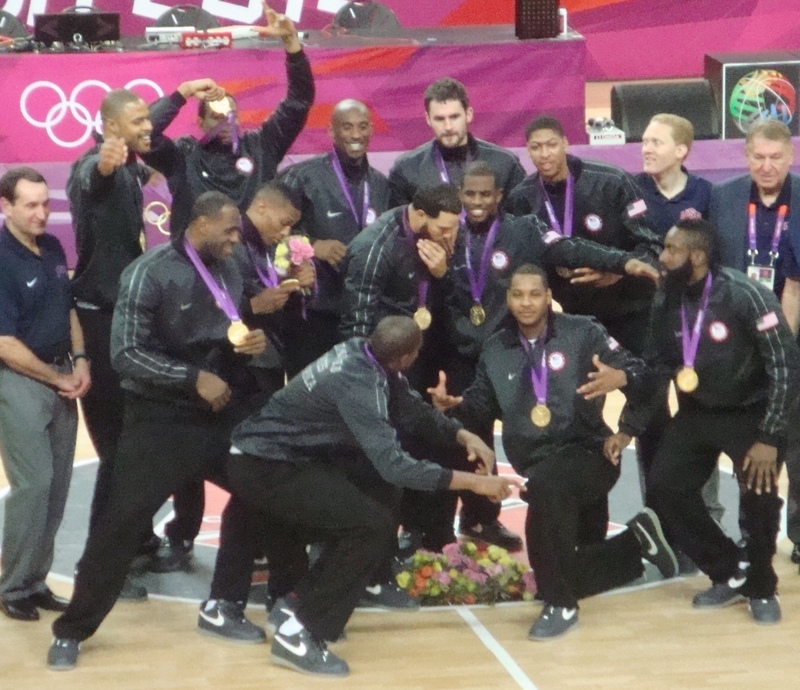 Tina Charles, Asjha Jones, Angel McCoughtry, Maya Moore and Lindsay Whalen all got their first gold.